Alibaba Group’s cloud computing business, AliCloud, signed a new partnership with NVIDIA to collaborate on AliCloud HPC, the first GPU-accelerated cloud platform for high performance computing (HPC) in China. AliCloud will work with NVIDIA to broadly promote its cloud-based GPU offerings to its customers — primarily fast-growing startups – for AI and HPC work. 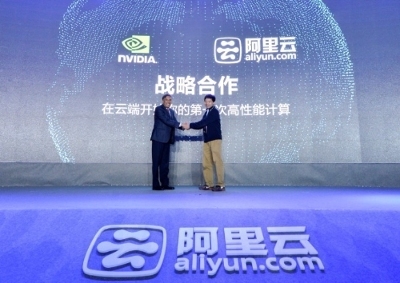 Shanker Trivedi, NVIDIA’s Global VP and Zhang Wensong, chief scientist of AliCloud at the Shanghai Summit ceremony. The two companies will also create a joint research lab, providing AliCloud users with services and support to help them take advantage of GPU-accelerated computing to create deep learning and other HPC applications.